Guess What Today Is? The 13th of the Month! Calling all rêveurs and rêveuses to show yourselves when you make your wardrobe choices today. Below I’ve posted my rêveuse picture for March. Feel free to post yours as well, or link to it in the comments section. Someone asked me if she could include gray in her outfit. I don’t see why not! Today I wore a shirt striped with black, white, and two grays and a dark charcoal skirt and black shoes. 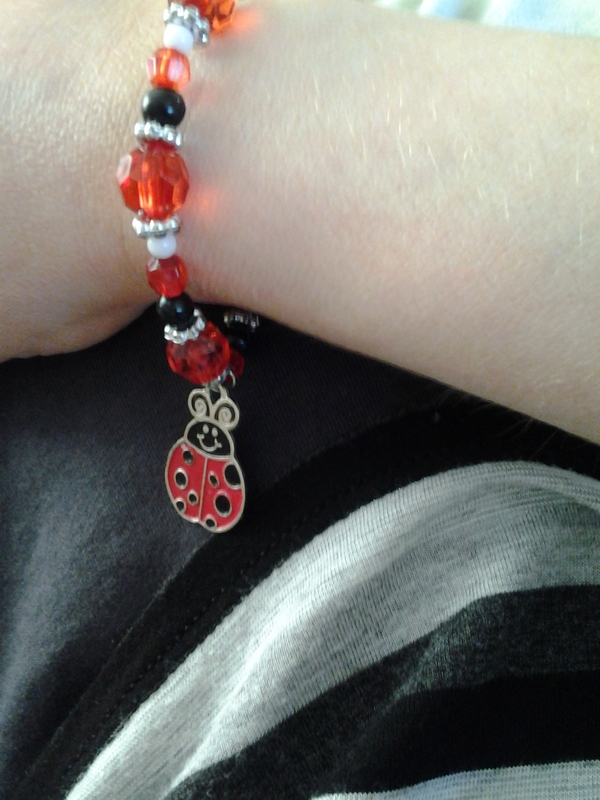 But I’m highlighting this ladybug bracelet my son gave me one day on a whim, because it “matched my outfit.” That was a 13th-of-the-month day, too. PJs because I am sick and am going back to bed. Aw, bummer on being sick! Get well soon.